Papua is the largest and easternmost province of Indonesia, comprising most of Western New Guinea. Papua is bordered by the nation of Papua New Guinea to the east, and by West Papua province to the west. Since 2002, Papua province has special autonomy status that makes its special region. Its capital is Jayapura. It was formerly called Irian Jaya (before that West Irian or Irian Barat) and comprised all of Indonesian New Guinea. In 2002 the current name was adopted and in 2003 West Papua province was created from western parts of Papua province. The name "West Papua" was adopted in 1961 by the New Guinea Council until the United Nations Temporary Executive Authority (UNTEA) transferred administration to the Republic of Indonesia in 1963. "West Papua" has since been used by Papuans as a self-identifying term, especially by those demanding self-determination, and usually refers to the whole of the Indonesian portion of New Guinea. The other Indonesian province that shares New Guinea, West Irian Jaya, has been officially renamed as West Papua, or Papua Barat. The entire western New Guinea is often referred to as "West Papua" internationally – especially among networks of international solidarity with the West Papuan independence movement. The province of Papua is governed by a directly elected governor (currently Lukas Enembe) and a regional legislature, DPRP (Dewan Perwakilan Rakyat Papua). A government organisation that only exists in Papua is the MRP (Majelis Rakyat Papua / Papuan People's Council), which was formed by the Indonesian Government in 2005 as a coalition of Papuan tribal chiefs, tasked with arbitration and speaking on behalf of Papuan tribal customs. Indonesian sovereignty over Papua dates back to 1969, when Indonesia conducted a referendum (referred to by the Indonesian government as the Act of Free Choice) on the self-determination of the peoples of Papua under an agreement with the United Nations to respect any result. Instead of conducting a democratic referendum amongst the general population, Indonesian security forces forcibly coerced a small number of tribal elders to vote to join Indonesia; some elders were not even made aware that a referendum was to be conducted beforehand. Nevertheless, the agreement with the UN was nominally upheld, and was recognised by the international community in spite of protests. This intensified the independence movement among indigenous West Papuans, deepening the Papua conflict, which began when the Dutch withdrew from the East Indies in 1963. The conflict has continued to the present, with Indonesian security forces being accused of numerous human rights abuses in their suppression of the independence movement. The Indonesian government maintains tight control over the region, barring foreign journalists or rights monitors from entering; those who do must do so covertly. In 1999 it was proposed to split the province into three government-controlled sectors, sparking Papuan protests. In January 2003 President Megawati Sukarnoputri signed an order dividing Papua into three provinces: Central Irian Jaya (Irian Jaya Tengah), Papua (or East Irian Jaya, Irian Jaya Timur), and West Papua (Irian Jaya Barat). The formality of installing a local government for Jaraka in Irian Jaya Barat (West) took place in February 2003 and a governor was appointed in November; a government for Irian Jaya Tengah (Central Irian Jaya) was delayed from August 2003 due to violent local protests. The creation of this separate Central Irian Jaya Province was blocked by Indonesian courts, who declared it to be unconstitutional and in contravention of the Papua's special autonomy agreement. The previous division into two provinces was allowed to stand as an established fact. The province of Papua is one of three provinces to have obtained special autonomy status, the others being Aceh and West Papua. According to Law 21/2001 on Special Autonomy Status (UU Nomor 21 Tahun 2001 tentang Otonomi khusus Papua), the provincial government of Papua is provided with authority within all sectors of administration, except for the five strategic areas of foreign affairs, security and defense, monetary and fiscal affairs, religion and justice. The provincial government is authorised to issue local regulations to further stipulate the implementation of the special autonomy, including regulating the authority of districts and municipalities within the province. Due to its special autonomy status, Papua province is provided with significant amount of special autonomy funds, which can be used to benefit its indigenous peoples. But the province has low fiscal capacity and it is highly dependent on unconditional transfers and the above mentioned special autonomy fund, which accounted for about 55% of total revenues in 2008.
logging companies had to pay compensations to local communities in addition to all other fees and taxes collected by the national government. As of 2010 (following the separation of West Papua Province in 2003), the residual Papua Province consisted of 28 regencies (kabupaten) and one autonomous city (kota); these regencies and the city are together subdivided into 385 districts (kecamatan), and thence into "villages" (kelurahan and desa). In Papua, as well as in the province of West Papua, kecamatan are commonly referred to as distrik. The regencies (kabupaten) and the city (kota) are listed below with their areas and their populations at the 2010 Census and according to the latest official (January 2014) Estimates. * The 2005 estimated population of Boven Digoel Regency is included in the figure quoted for Merauke Regency, from which Boven Digoel was divided. # The 2005 estimated population of this regency are included in the figures quoted for the existing regency from which the newer regency was divided in 2007 or 2008. On 8 January 2004, Supiori Regency was split from Biak Numfor Regency. Central Mamberamo Regency with five districts, with Kobakma as the regental seat. Created by the Law No. 3/2008, the first regent was David Pagawak. Yalimo Regency also has five districts, with Elelim as the regental capital. Created by the Law No. 4/2008, the first regent was Elia Ibrahim Loupatty. Lanny Jaya Regency with 10 districts, with Tiom as the regental capital. Created by the Law No.5/2008, the first regent was Pribadi Sukartono. Nduga Regency with 8 districts, with Kenyam as the regental capital. Created by the Law No. 6/2008, the first regent was Hans Dortheus. Puncak Regency also has 8 districts, with Ilaga as the regental capital. Created by the Law No. 7/2008, the first regent was Simon Alom. Within 2008, Intan Jaya and Deiyai Regencies were split from Paniai Regency. Another new province, to be split from West Papua will be Southwest Papua. The new Central Papua Province, and the residual Papua Province, would together include the new regencies. The city of Jayapura also has the status of an autonomous city, equal to a regency. It was founded on 7 March 1910 as Hollandia and is the capital. Since Indonesian administration the name of the city has been changed to Kotabaru, then to Sukarnopura before its current name, Jayapura. Jayapura is also the largest city of Papua Province, with a small but active tourism industry. It is built on a slope overlooking the bay. Cenderawasih University (UNCEN) campus at Abepura houses the University Museum where some of the Asmat artifacts collected by Michael Rockefeller is stored. Both Tanjung Ria beach, near the market at Hamadi – site of 22 April 1944 Allied invasion during World War II – and the site of General Douglas MacArthur's World War II headquarters at Ifar Gunung have monuments commemorating the events. A central east–west mountain range dominates the geography of the island of New Guinea, over 1,600 km (1,000 mi) in total length. The western section is around 600 km (400 mi) long and 100 km (60 mi) across. The province contains the highest mountains between the Himalayas and the Andes, rising up to 4,884 metres (16,024 ft) high, and ensuring a steady supply of rain from the tropical atmosphere. The tree line is around 4,000 metres (13,000 ft) elevation and the tallest peaks contain permanent equatorial glaciers, increasingly melting due to a changing climate. Various other smaller mountain ranges occur both north and west of the central ranges. Except in high elevations, most areas possess a hot humid climate throughout the year, with some seasonal variation associated with the northeast monsoon season. The southern and northern lowlands stretch for hundreds of kilometres and include lowland rainforests, extensive wetlands, savanna grasslands, and expanses of mangrove forest. The southern lowlands are the site of Lorentz National Park, also a UNESCO World Heritage Site. The province's largest river is the Mamberamo located in the northern part of the province. The result is a large area of lakes and rivers known as the Lakes Plains region. 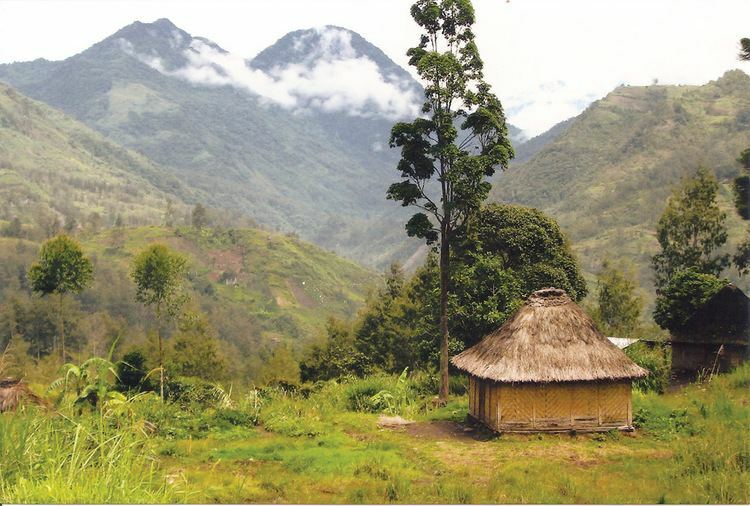 The Baliem Valley, home of the Dani people, is a tableland 1,600 metres (5,200 ft) above sea level in the midst of the central mountain range. Puncak Jaya, also known by its Dutch colonial name, "Carstensz Pyramid", is a limestone mountain peak 4,884 metres (16,024 ft) above sea level. It is the highest peak of Oceania. The Yei (pronounced Yay) are sometimes known as the Jei, Je, Yei-nan people. There are approximately 2,500 speakers of the Yei language. 40% Ethno Religionists- animistic tribal religion 60% Catholics and other Christians (blended with animistic beliefs & customs): The Yei language is believed to have two dialects observed by a Wycliffe, SIL language survey in 2001. At home the Yei people speak their own language but use Indonesian for trade, wider communication and at school. Most Yei are literate in Indonesian. There are elementary schools in each village. About 10–30% of children continue in middle school. Very few go to high school. The nearest high school is in Merauke city. They live primarily by hunting, fishing, and gardening short and long term crops in the lowlands. The Yei diet mainly consists of rice, vegetables, fish and roasted sago. With their land at an altitude of less than 100 meters above sea level, the Yei people can best be accessed by vehicle on the road from Merauke or by motorized canoe up the Maro River. There is no airstrip or airplane access other than float plane which is currently available from Merauke through MAF by about a 15-minute flight to Toray. The Poo and Bupul villages have a clinic but people still use traditional medicines. There is very little infrastructure in the area: no telephones or toilets. At night electricity is run from a generator. There are single side-band radios (SSBs) in Bupul, Tanas, Poo, and Erambu villages, mainly used by the police and military force. Most villages get their drinking water from the Maro River, but some get it from wells or by collecting rain. The population of Papua province has a fertility rate of 2.9 children per woman The population grew from the 1.9 million recorded in the 2000 Indonesia Census, to 2.9 million as recorded by the 2010 Census, and is officially estimated to be at about 3.5 million in 2014. Since the early 1990s Papua has had the highest population growth rate of all Indonesian provinces at over 3% annually. This is partly a result of birth rates, but mainly due to migration from other parts of Indonesia. While indigenous Papuans formed the near-totality of the population in 1961, they are now roughly 50% of the population, the other half being composed of non-Papuan migrants coming from other parts of Indonesia. An overwhelming percentage of these migrants came as part of a government-sponsored transmigration program. The densest population center, other than the large coastal cities that house Indonesian bureaucratic and commercial apparatus, is located in and around the town of Wamena in the Baliem Valley of the Central Highlands. According to the 2010 census, 83.15% of the Papuans identified themselves as Christian with 65.48% being Protestant and 17.67% being Roman Catholic. 15.89% of the population was Muslim and less than 1% were Buddhist or Hindu. There is also substantial practice of animism by Papuans. In 2011, Papuan caretaker governor Syamsul Arief Rivai claimed Papua's forests cover 42 million hectares with an estimated worth of Rp.700 trillion ($78 billion) and that if the forests were managed properly and sustainably, they could produce over 500 million cubic meters of logs per annum. The Grasberg Mine, the world's largest gold mine and third largest copper mine, is located in the highlands near Puncak Jaya, the highest mountain in Papua. The island has an estimated 16,000 species of plant, 124 genera of which are endemic. Papua's known forest fauna includes; marsupials (including possums, wallabies, tree-kangaroos, cuscuses); other mammals (including the endangered long-beaked echidna); bird species such as birds-of-paradise, cassowaries, parrots, and cockatoos; the world's longest lizards (Papua monitor); and the world's largest butterflies. The waterways and wetlands of Papua are also home to salt and freshwater crocodile, tree monitors, flying foxes, osprey, bats and other animals; while the equatorial glacier fields remain largely unexplored. Protected areas within Papua province include the World Heritage Lorentz National Park, and the Wasur National Park, a Ramsar wetland of international importance. In February 2006, a team of scientists exploring the Foja Mountains, Sarmi, discovered new species of birds, butterflies, amphibians, and plants, including possibly the largest-flowered species of rhododendron. Ecological threats include logging-induced deforestation, forest conversion for plantation agriculture (including oil palm), smallholder agricultural conversion, the introduction and potential spread of alien species such as the crab-eating macaque which preys on and competes with indigenous species, the illegal species trade, and water pollution from oil and mining operations. Religion Ministry has awarded Harmoni Award 2016 to Papua Regency due to religion tolerance in this area. Jayapura as a capital city of Papua Regency is also got the same award. The ministry give 10 awards, 3 award for provinces and 7 for regencies/cities.